Last October, when mudslides ravaged Guatemala, killing more than 600 people and displacing 6,000 more, Haverford's women's volleyball team was making its stretch run toward the playoffs. Heidi Jutsum is a key player on the team, providing vital senior leadership and sheer athleticismâ€”she holds the College's single-match record for attack percentage, a .680 mark she accomplished against Ursinus on Oct. 13, 2004. She is third all-time in kills and ranks among the all-time leaders in a number of other offensive categories. She is a two-time First Team All-Centennial Conference honoree and was a Third Team District II All-Academic selection by the College Sports Information Directors of America (CoSIDA). With this kind of competitive streak, imagine Heidi's predicament when it came to going on a relief mission to Guatemala or playing in a key game against Johns Hopkins. She went to Guatemala, to the stricken village of Panabaj. “Most of my teammates understood my connection to the community and the reasons why I had to go,” she says.“And Greg Kannerstein and John Douglas were so supportive.” Haverford ended up losing that match but still made the Centennial Conference playoffs in what was a very successful season; the Fords reached the semifinals, where they lost to Gettysburg and wrapped up an 18-9 season. Jutsum has visited Guatemala six times over the past two years. Before Hurricane Stan and the ensuing mudslide, the trips (initially arranged by Professor Anita Isaacs and supported by the Center for Peace and Global Citizenship) were focused on supporting the initiatives of the village's widows of Guatemala's“internal armed conflict” to right themselves economically while coming to grips with what amounts to genocide. The widows wanted to focus on economic development by improving their handicrafts for retail and also to increase opportunities for their children. “It was just an amazing experience,” she says,“and I knew the first time I went that I had to go back.” After her initial visit, Jutsum worked with people from the International Humanitarian Foundation, which was started by Harvard and Dartmouth graduates and works to connect student volunteers and university resources to local grassroots initiatives in developing countries. Jutsum spent last summer on computer training for the Panabaj children and established music, sports, games, and arts programming for them.“Being an athlete helps you internationally,” she says.“You can always relate on a human level, playing basketball or soccer or volleyball, especially when there are significant language and social barriers.” In addition to using her athletic talents to connect with youth and children, Jutsum helped the Panabaj women come up with preferred color combinations for their handicraftsâ€”and brought many of their crafts back to Haverford for sale. In October, one week after the mudslide struck Panabaj, Isaacs and Jutsum traveled to Panabaj again to ensure the transport and delivery of relief supplies which were flown down on an Air Canada plane, arranged by Isaacs, whose brother works for the airline. During this trip, Jutsum witnessed the frustrations that can occur when a government attempts to remedy a situation without sufficient information. It turned out that the Guatemalan government would guarantee new housing for the displaced residents if the new construction happened in the same area prone to mudslides, but would not guarantee housing if construction took place in safer areas.“It's still a political wrestling match down there,” she sighs. Other efforts were more productive. Isaacs, Jutsum, and other students (including fellow Haverford athlete Ian Ramsey-North '08, who is currently taking a year away from his work at Haverford to continue his volunteer efforts in Panabaj) worked with the Panabaj Community Development Organization (ADECCAP) and the American Friends Service Committee to raise nearly $80,000 for a community center, professional training, educational programming for children, and a community chicken farm. Through the Watson, Jutsum will be able to explore other indigenous organizations in Latin America to see just what works on a local community model. She will leave on Aug. 1 for Ecuador, Peru, and Bolivia, visiting two or three communities in each country.“You really need at least a few months of time to experience the community dynamics, see the different way people organize, the farming organizations, the handicraft cooperatives, all the indigenous resources,” she says. Every quarter she will produce a three-to-four page report on her progress, plus a financial accounting. At the fellowship's end, she is to produce a five-page summary report and a final financial accounting (returning any unused funds) before she attends a conference with other Watson Fellows. 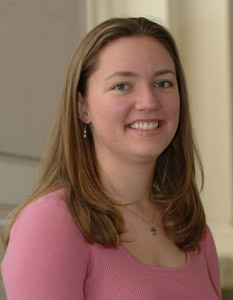 She is planning a July wedding to her Dartmouth fiancÃ©, Ryan McAnnally-Linz, who will travel with her on the Watson. She then plans a return to Guatemala for at least a year. After that, she likely will work for a non-profit organization while McAnnally-Linz attends graduate school. She won't be playing competitive volleyball. Click here for a video documentary by David Felsen '92 about Guatemala and Haverford student volunteers.